Posted on October 8, 2013 . 4 Comments. Originally from “Pushing to the Front” (1911) by Orison Swett Marden. Included in the collection “The Art of Manliness Manvotionals” by Brett and Kate McKay. 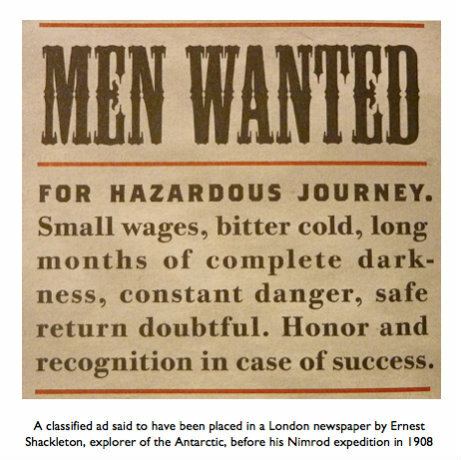 Wanted, a man who is larger than his calling, who considers it a low estimate of his occupation to value it merely as a means of getting a living. Wanted, a man who sees self-development, education and culture, discipline and drill, character and manhood, in his occupation. Wanted, a man of courage who is not a coward in any part of his nature. Wanted, a man who is symmetrical, and not one-sided in his development, who has not sent all the energies of his being into one narrow specialty and allowed all the other branches of his life to wither and die. Wanted, a man who is broad, who does not take half views of things; a man who mixes common sense with his theories, who does not let a college education spoil him for practical, every-day life; a man who prefers substance to show, and one who regards his good name as a priceless treasure. Wanted, a man “who, no stunted ascetic, is full of life and fire, but whose passions are trained to heed a strong will, the servant of a tender conscience; who has learned to love all beauty, whether of nature or of art, to hate all vileness, and to respect others as himself”. The world wants a man who is educated all over; whose nerves are brought to their acutest sensibility; whose brain is cultured, keen, incisive, broad; whose hands are deft; whose eyes are alert, sensitive, microscopic; whose heart is tender, magnanimous, true. The character sympathizes with and unconsciously takes on the nature of the body. A peevish, snarling, ailing man can not develop the vigor and strength of character which is possible to a healthy, robust, cheerful man. There is an inherent love in the human mind for wholeness, a demand that man shall come up to the highest standard; and there is an inherent protest or contempt for preventable deficiency. Nature, too, demands that a man be ever at the top of his condition. The first requisite of all education and discipline should be man-timber. Tough timber must come from well grown, sturdy trees. Such wood can be turned into a mast,, can be fashioned into a piano or an exquisite carving. But it must become timber first. Time and patience develop the sapling into the tree. So through discipline, education, experience, the sapling child is developed into hardy mental, moral, physical man-timber. If the youth should start out with the fixed determination that every statement he makes shall be the exact truth; that every promise he makes shall be redeemed to the letter; that every appointment shall be kept with the strictest faithfulness and with full regard for other men’s time; if he should hold his reputation as a priceless treasure, feel that the eyes of the world are upon him, that he must not deviate a hair’s breadth from the truth and right; if he should take such a stand at the outset, he would … come to have almost unlimited credit and the confidence of everybody who knows him. What are palaces and equipages; what though a man could cover a continent with his title-deeds, or an ocean with his commerce; compared with conscious rectitude, with a face that never turns pale at the accuser’s voice, with a bosom that never throbs with fear of exposure, with a heart that might be turned inside out and disclose no stain of dishonor? To have done no man a wrong; … to walk and live, unseduced, within arm’s length of what is not your own, with nothing between your desire and its gratification but the invisible law of rectitude–this is to be a man. Brett McKay is a man. Kate McKay loves manly men. Together, these partners in crime run Art of Manliness, one of the largest men’s websites on the Internet. They are also the authors of “The Art of Manliness: Classic Skills and Manners for the Modern Man.” The husband and wife team resides in Tulsa, Oklahoma, with their son, Gus. Brett McKay is a man. Kate McKay loves manly men. Together, these partners in crime run Art of Manliness, one of the largest men’s websites on the Internet. They are also the authors of "The Art of Manliness: Classic Skills and Manners for the Modern Man." The husband and wife team resides in Tulsa, Oklahoma, with their son Gus. pavel easy strength the book play a big part in strong first training method ? This should be required reading in every school by student and teacher alike. I am a German teacher of English as Secondary Language here in Germany who loves reading about Training adn Training itself. I do consider myself a mere beginner, but I am not giving up. striving for excellence eventually pays off. Actually I honestly think about using this very article for my grade 11 to grade 13 students of ESL students here in Germany. I am currently reading a book about how to best educate and help boys grow, since my Little one is turning three in december – and a lot of what Steve Biddulph is saying is strikingly similar to what Brett and kate refer to. Great comments, Michael. This is a fantastic article. Art of Manliness a great website. The McKays are wonderful leaders of men and women. Thanks. Micheal, Steve Biddulph is an Australian author, I believe? What is the best starting point with his books, which one should I read first? I have a boy, Joseph, who recently turned 5 years old. Joe is 1/8 German. I am 1/4 German, out of interest, my Grandmother was a Holz. I don’t know what part of Germany her people came from (mid-1800s). They were dairy farmers around a town called Boonah in Queensland, Australia. All the best to everyone using StrongFirst as a tool for self-development and growing stronger. I feel truly blessed to have bought Pavel’s “Enter the Kettlebell” in June last year, on a whim, I saw kettlebells as a way to train as I recovered from a knee reconstruction…. It has helped me tremendously. It has changed my life for the better. I have lost 20kgs of body fat and gained so much more than just a somewhat better physical body. It’s helped me regain self-respect and it has led me on to some many other things I would never have thought I was capable of. It’s helped me to be a better dad and improving, always, as a husband. I am setting and achieving goals I would not have dreamed of 18 months ago. I’m still a beginner. I look forward to the next 20, 30, 40 years or more of getting stronger and better at whatever I set my mind to. I cannot wait for late November when I attend the SFG Level 1 in Perth, Australia. For those who care – Wallabies to upset the All Blacks in the rugby tonight in Dunedin.